It has been a busy Sunday afternoon in August with the summer temperatures starting to cool and a cooler than usual September in the forecast. I took the time today to give the garden a face lift and rejuvenate some of my fading perennials. 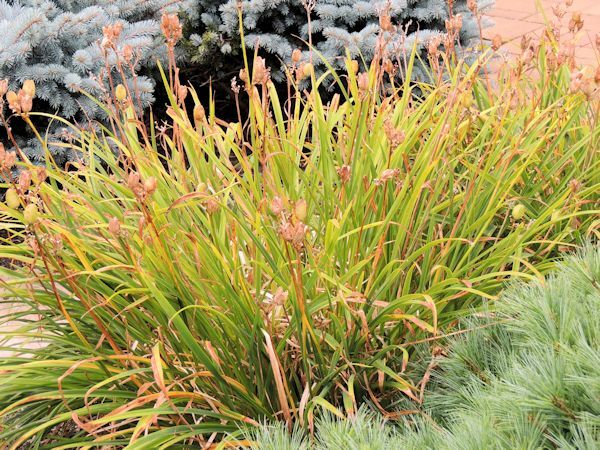 By the time late July and August roll around various perennials are starting to show signs of fall mode with yellowing and dying foliage as they are starting to go dormant. 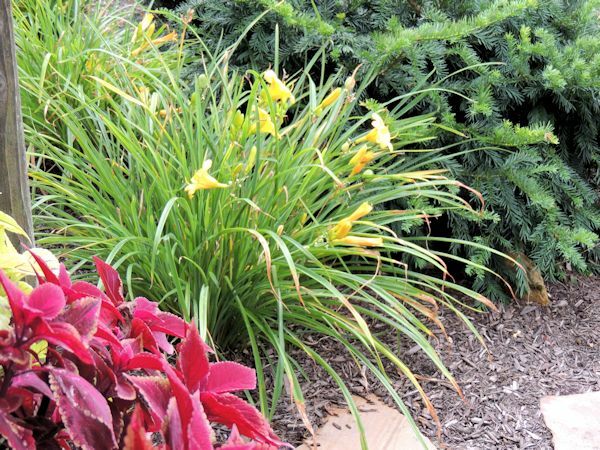 Perennials such as daylily go dormant at the end of summer into fall but there are methods to extend the bloom time right into mid to late September. With certain species of long blooming daylily such as ‘Stella D Oro’ there is a trick I learned initially by accident. I had some late summer garden maintenance done a few years ago and the crew had cut the yellowing daylilies back to about four inches from the ground. At first I was taken by surprise but within a couple of weeks I had brand new vibrant green foliage and blooms that lasted well into fall. From that time on I continued to follow this ritual of cutting back my lilies starting at the end of July and into mid-August so that I could enjoy constant blooms. The procedure is quite simple and I stage the rejuvenation at different times for the various locations of lilies in my garden. 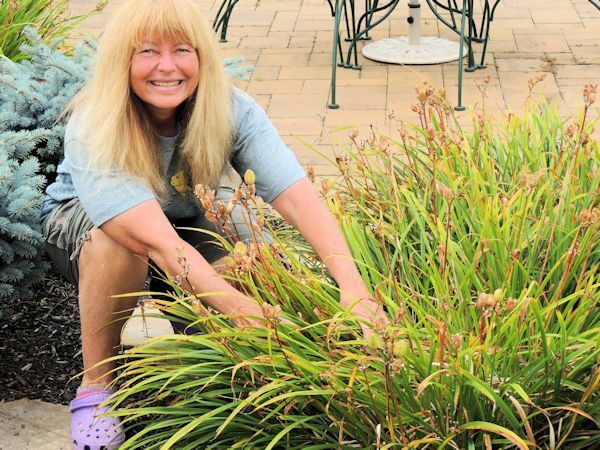 Starting at the end of July and into late August I carefully remove expired yellowed foliage on my perennial daylilies down to new growth which is approximately four to five inches above the ground. I actually perform this by hand but you can also use pruning shears and if there are any blooms on the plant you can leave them to enjoy. This ritual of removing dead foliage stimulates the plant to produce healthy new leaves and blooms and also prevents the onset of fungal disease that can occur at this time of year with decaying foliage. 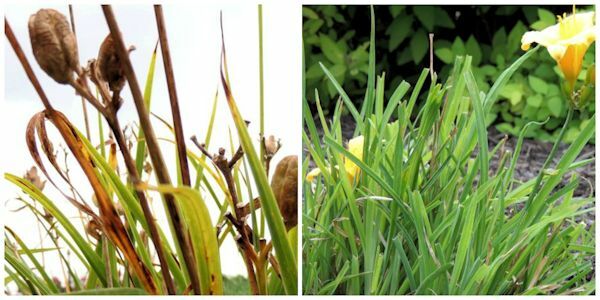 I also remove the expired scapes (bloom bearing stalks) from the plants as soon as they turn brown throughout the entire season which stimulates new blooms. The photograph on the left shows how the stalks should appear when you remove them. It is easy to know when this should be done since the stalks with seed heads will very easily pull out without any effort. The photograph on the right shows newly cut foliage right after rejuvenation. Once your daylilies are cut back be sure they continue to receive watering. In no time you will have plants that appear as they do in early spring bursting with beautiful new growth and flowers. Once the plants have had their final bloom into the fall allow the foliage to die completely back and then remove any decaying debris from around the plant and apply a thin layer of mulch. This method also works with other varieties of daylily with a shorter bloom time such as ‘Pardon Me’ and ‘Sammy Russell’ but should be performed in July after these plants are done blooming. Other perennials such a Salvia also benefit from a mid-late summer pruning which is explained in this article. 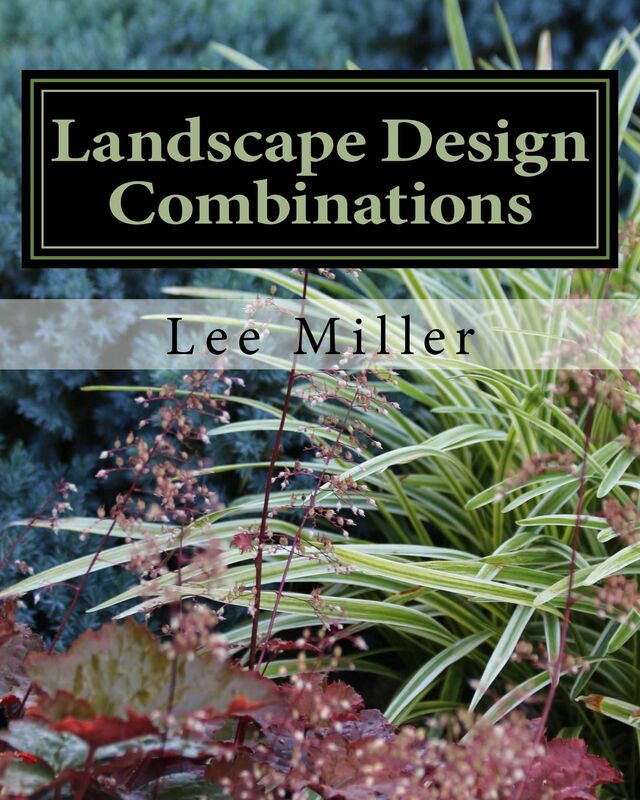 If you are looking to extend the enjoyment of your summer garden rejuvenation is a simple and quick process well worth the time for it will prolong your enjoyment of blooms well into fall.